Twenty-five canvases by Academy Award winning actor Sir Anthony Hopkins will make up the upcoming exhibit at Millenia Fine Art Gallery in Orlando, Florida. This will be the first exhibit of the Hopkins’ work ever shown in Florida. The paintings will be on display from November 9 to December 31, 2007. 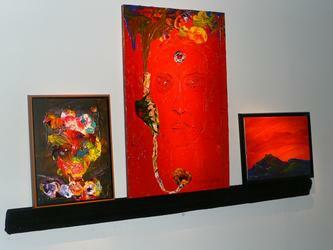 The image posted here shows a few of the pieces from the exhibit. For more information contact the gallery at 407.226.8701 or visit the Millenia Fine Art Gallery website.